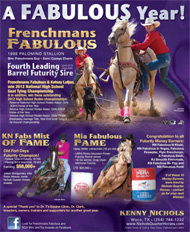 "Quality Performance Horses for 4 Generations"
MILLIONAIR SIRE: Frenchmans Fabulous (Fab) is a proven sire of barrel horses, rope horses, goat tying, steer wresting, team penning, team sorting and dressage. Fab is a proven athlete himself in barrels, roping, and goat tying. Fab is making his mark in the performance horse industry. 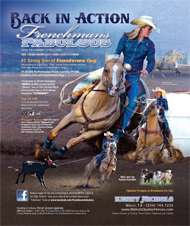 Fab has over $1 Million Progeny Life Time Earnings in Barrels, Roping & Steer Wrestling! PER 2016 EQUI-STAT 10 YEAR AVERAGE OFFSPRING EARNINGS REPORT FAB’S ARE ONLY ABOUT $1,200 LESS THAN HIS SIRE FRENCHMANS GUY. Fab is out of the legendary mare Casey's Charm and sired by Frenchmans Guy. 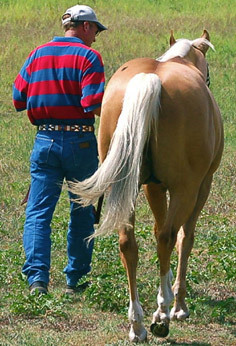 Casey's Charm was a feature horse in Western Horseman's Legends Volume 6. 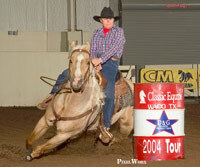 Western Horseman states Casey’s Charm is "one of the premiere barrel racing producers of all time". 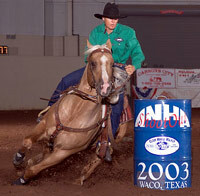 Caseys Charm has also been called the first lady of barrel racing. Fab was featured in Western Horseman’s November 2013 issue. 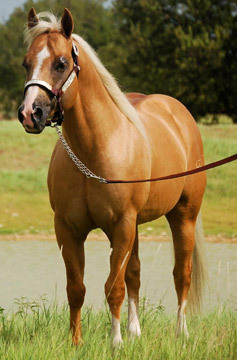 An added bonus when looking at his bloodlines is he is double-bred AQHA Hall Of Fame mare Casey’s Ladylove. Casey’s Ladylove is dam of Caseys Charm and granddam of Frenchmans Guy. Fab has sired more barrel money earners than any other siring son of Frenchmans Guy. Fab’s money earners are numerous, not just one or two superstars earning all the money documents in Equi-Stats. There are numerous money winners not documented with Equi-Stats, however we are just letting everyone know what is very proven and documented in Equi-Stats. 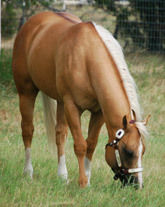 Fab is a Leading Equi-Stat Sire in All Divisions. As of October 2015 he is sire of 253 Futurity Age horses with $700,000+ Equi-Stat earnings. 51 FUTURITY WINS including Old Fort Days (Ft Smith), BBR Finals, Greg Olson, Classic Equine, Fizz Bomb, WPRA World Finals, WRAPN3, UBRC Finale/CSR, Roper Rally, Barrel of Gold, Colorado Classic, Dash For Gold, Montana Barrel Daze, Dash and Dance, Hawki Futurity, C-N California Futurity, etc. 19 DERBY WINS including BFA, Classic Equine, PACWest, WRAPN3, Tour of Champions, Chowchilla Stampede, UBRC Finale/CSR, Old Fort Days (Ft Smith), BBR Finals, Fizz Bomb, etc. 46 OPEN WINS including American Rodeo Semi-Finals Qualifers, NBHA (Las Vegas, World Finals, New Years Bustin Out), Diamonds and Dirt, Elite, Lucky Dog, Barrel Bash, Classic Equine, Win More Barrel Productions, etc. RODEO EARNERS including NFR Steer Wrestling, CNFR and NHSRA Barrels, Goat Tying and Roping, USTRA Finals, World Series Finals, etc. #1 AQHA Performance Point Earning (ROM) Stallion son of Frenchmans Guy. He has more AQHA performance points than any stud sired by Frenchmans Guy. Currently (per September 2012 Equi-Stat) Fab is the #4 Futurity Sire. KN Fabulous N Khaki, KN Fabulous In Vegas, Fabulous Firewater, Flyin Frenchman, A Fabulous Dash, RJ Smooth Frenchsilk, KN Fabulous Be Flyy, KN Fabulous FedX, and Mia Fabulous Fame. Contact us for your next Winner! A Future Fortunes Stallion, Triple Crown 100 Program, along with the WPRA Pro-Elite Sire program and TQHA Barrel Sire Incentive. Tested negative for EVA and has been vaccinated. Fab is a working horse, still performing in the Arena. 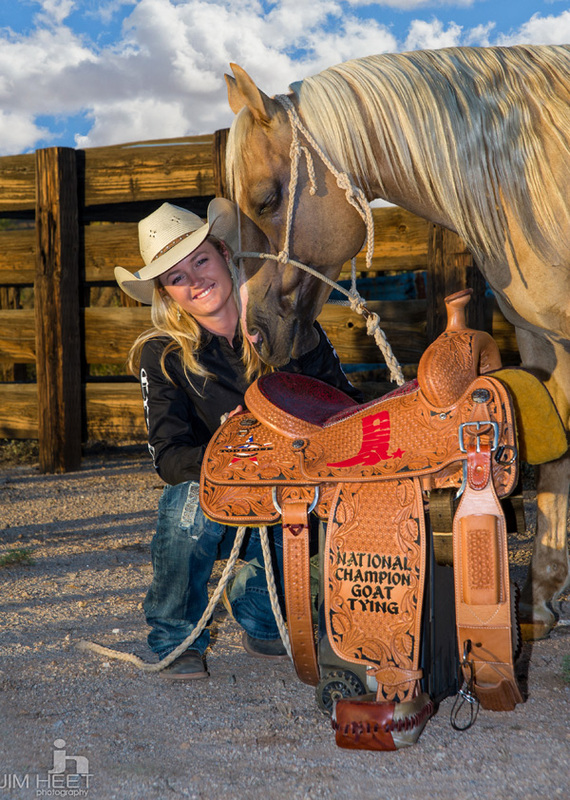 He and Kelsey Lutjen have won the 2012 National High School Rodeo Asso Goat Tying Championship, Arizona High School Finals Breakaway title, Year-End title in Goats, and Year-End All-Around title for the Arizona High School Rodeo Asso. Fab was the National High School Rodeo Asso Girls Reserve AQHA Horse of the Year and won the Arizona High School Rodeo Asso Girls AQHA Horse of the Year. Roping: Expressing his great cow sense making him an accomplished arena competitor ‘03 Reserve Champ. Calf Roping; ’02 Bold Heart Reserve Champ. Heeler, Huron (SD) 3rd Open Heeler. Fabulous is a power-packed stallion. At 14.3 HH, 1100 lbs, he is a richly bred stud, a high caliber competitor and a proven young sire. His mind is quiet and incredibly intelligent, his movement powerful but smooth, and his quickness unbelievable. His disposition is better than most geldings. Fabulous is a strong breeding stallion-siring impressive foals stamped with his class, well-built confirmation, substance and athletic ability. 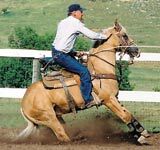 His heart and try, versatility, long fluid movement, explosive speed, extreme intelligence, and kind disposition put him among the elite for a future in the performance/barrel horse industry. Fab is a phenomenal athlete with a pedigree to match.